One month later, on November 12, he spoke with them about a plan for a society that he might found so that, once they became priests, they could stay together. “Let us stay united; do not disperse to your modernist dioceses after your ordination! It will be a society of common life, with common residence, prayer and apostolate.” He remembered his project in Tulle: to rally his poor, young, isolated, discouraged priests of Correze. 1. Canon Law has a whole chapter on societies of common life without vows: 1917 CIC, Canons 673-681. It would be a priestly society of apostolic life. It would be centered on the priesthood, on everything that prepares for it and everything that results from it. 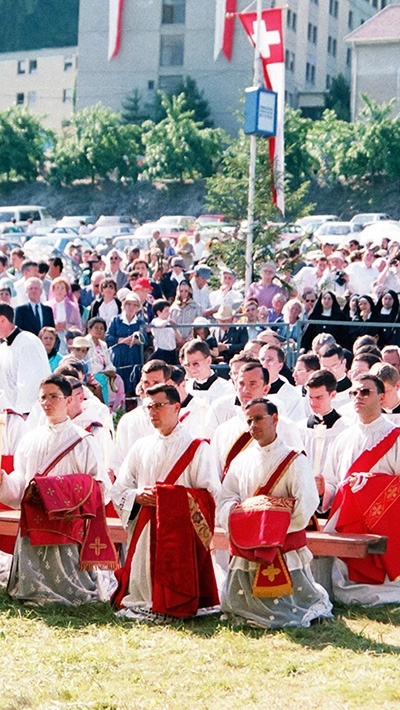 Its purpose would be the formation of future priests in seminaries, then the sanctification of priests through retreats, and finally the priestly apostolate. It would revolve around the Mass and would be placed under the patronage of St. Pius X, the last canonized pope, the pope of the struggle against modernism, yes, but most importantly the pope whose primary concern had been the formation of priests, “combining holiness of life with learning”. He spoke on the basis of his missionary experience. He had in mind the Messieurs du St. Esprit (Gentlemen of the Holy Ghost) of Claude Poullart des Places, who took no vows; not long before he had thought of reviving the community, considering the many Spiritan novices who wanted to work in the missions but were not much inclined to take religious vows. He knew very well what he wanted to do, but for many long months sickness and the weakness of his recruits held him back. Nevertheless his idea was consonant with the best tradition of the Church, the tradition of Sts. Martin and Augustine, of St. Vincent de Paul and his Congregation of the Mission, of Blessed Bartholomew Holtzhauser. Canon Law (Canon 134) recommends “the custom of common life among clerics”. Marcel Lefebvre would simply give that common life a soul: at the seminary, a half hour of mental prayer before the community morning Mass, one part of the Divine Office recited in common in Latin each morning, noon and evening, the daily rosary recited for the intentions of the benefactors, silence inside the house so as to foster study and the interior life, a certain reserve toward persons from outside: those were the rules. After the seminary, this way of life would be preserved in the priories. Marcel Lefebvre’s idea proved to be inspired. Very quickly, after the first ordinations, his priories became a success: cloisters of recollection, centers of fraternal life, havens of study and prayer, bases for the apostolate. Most often a priory was made up of three priests and several brothers; a community of women religious was located nearby and helped with housekeeping, at the school, and above all by the graces of their life of prayer and self-sacrifice. 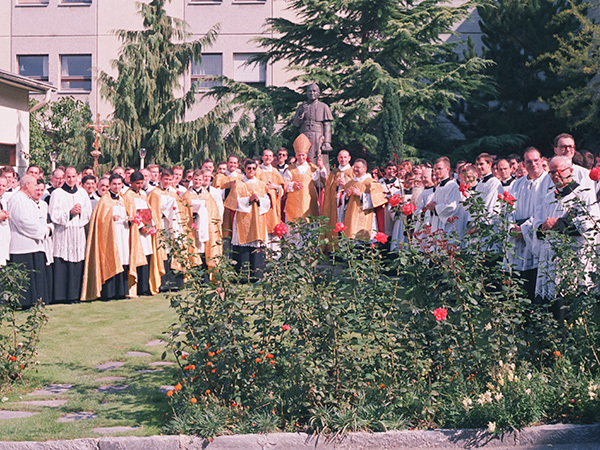 On November 1, 1970, on the Feast of All Saints, the Bishop of Fribourg canonically erected the Society and approved its statutes. 2. St. Pius X, Encyclical E supremi apostolatus, October 4, 1903. "So what can we do to protect priests in their priestly life and to make their apostolat easier? The solution is for priests to live in community in a priory." Archbishop Lefebvre ordained 17 new priests at Econe.